IMCDb.org: 1975 Chevrolet Impala in "Snutarna - SWIP, 1994"
If that's a bowtie above the grille, it's a 1975 Impala or even a Bel-Air. 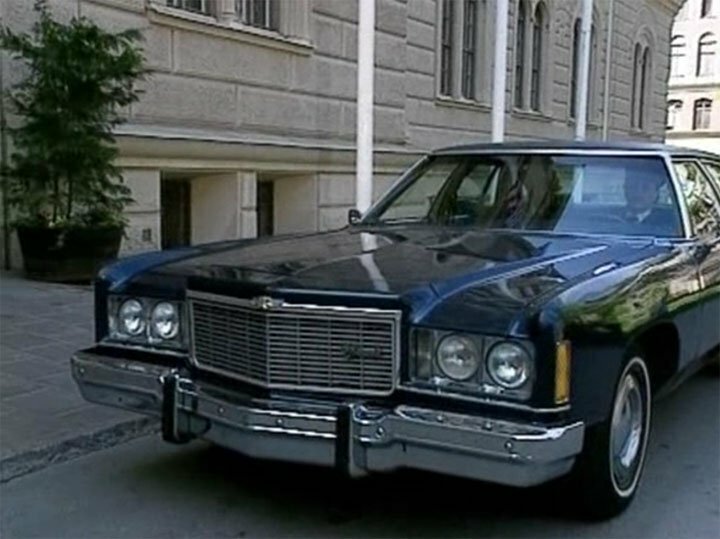 If it's a Fleur-de-Lys, it's a 1974 Caprice. It's an Impala, notice the lack of chrome molding on the side. Then that makes this a 1975. But the car does has full hubcap. Judging the condition of the car, it could be repainted with the trim removed. BTW this car does not have US spec headlight. rjluna2 wrote But the car does has full hubcap. Judging the condition of the car, it could be repainted with the trim removed. BTW this car does not have US spec headlight.